SOUTHFIELD, Mich., April 3, 2019 – The Honorable Kenson J. Siver, Mayor of the City of Southfield, has officially designated Saturday, April 27, 2019 as “Spaulding for Children Day” in recognition of Spaulding for Children’s 50 years as a not-for-profit organization in service to adopted and foster children. The proclamation also heralds Families in Bloom, a free family event that celebrates the anniversary and demonstrates how strong families help build strong communities. 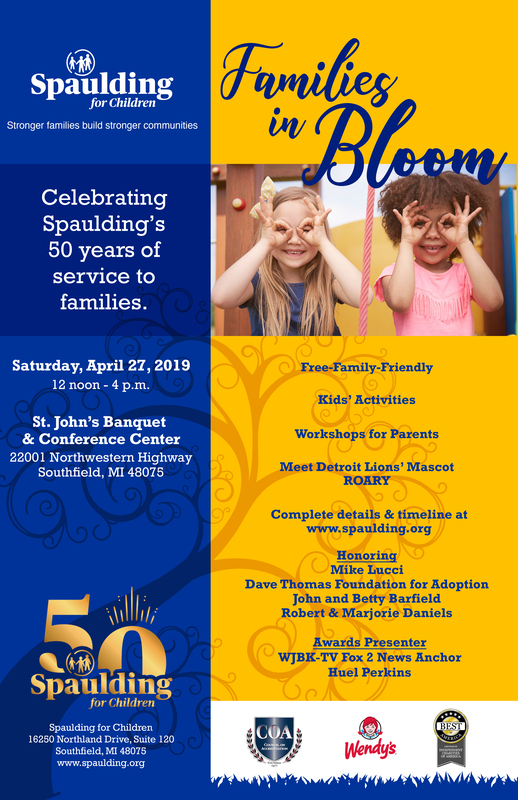 Families in Bloom takes place Saturday, April 27 from noon to 4 p.m. at St. John’s Banquet and Conference Center, 22001 Northwestern Highway, Southfield, Michigan, 48975. Free and open to the public of all communities, the event includes workshops for adults and activities for children. The event also honors individuals whose work and support have made Spaulding for Children an important resource for children and families. Spaulding was founded in 1968 with the goal of finding a permanent family for every child who needs one. “The John and Betty Barfield Angel Award”— Mr. Barfield’s wish was for SFC to have the resources to fund 100 adoptions annually and started the Partners Endowment Campaign. “The Robert ‘Bob’ and Marjorie Daniels Lighthouse Award” – Mr. Daniels was a charter board member and a beacon, bringing many companies and individuals to support SFC. “The Mike Lucci Ambassador Award” – Mr. Lucci was an ambassador for the children and SFC for more than 30 years, raising over a million dollars through his annual golf outing. “The Dave Thomas Spirit of Adoption Award” – Mr. Thomas dedicated his life to helping children get adopted. SFC continues to work with his foundation, supported by Wendy’s franchisees. Fox 2’s Huel Perkins emcees the Families in Bloom awards ceremony, which begins at 2 p.m. Among the honorees and dignitaries in attendance will be Detroit Lion’s legend Mike Lucci. Sponsors include Wendy’s Detroit Area Franchisees, the Michigan/Wayne County Department of Health and Human Services, Annette & Company School of Dance, and Health Alliance Plan. Joining them are Meijer’s, English Gardens, and Big Families. Kids First Initiative will present activities to introduce children to the excitement of science with Richard Bell. Ascension Providence Hospital will conduct free health checks for blood sugar, blood pressure, and Body-Mass Index (BMI). Southfield Public Library will host readings and children’s activities. Southfield Police will discuss public and community safety. Southfield Parks & Recreation will distribute information about summer programs. Annette & Company will hold dance performances and demonstrations. In addition, other organizations and exhibitors will present resources and opportunities for families and children. Spaulding for Children is a national leader in developing and providing resources and training for foster and adoptive families and those who serve and support them. Started in 1968 with the belief that every child is adoptable, Spaulding brought attention to foster children with special needs. Today Spaulding provides research-based training and education for those interested in becoming adoptive and foster parents in addition to partnership projects funded through the Michigan DHHS and the Children’s Bureau and parenting and preventive support program for young women who are pregnant or young mothers between the ages of 13-24 children with risk factors for child abuse and neglect. Spaulding for Children prevention program includes assistance, coaching and mentoring for the most vulnerable parents and have achieved a significant success rate in keeping families intact.